Frink developed her own personal style of bronze patination over a number of years and created her large body of work without the aid of assistants: ‘This enabled me to have the last word, which was very important to me’. Frink would use a skeletal framework of chicken wire and metal rods as a base over which she would model with plaster of Paris, liquid or soaked strips of cloth, bulked with card or small pieces of wood. The mass would then be chiselled and shaped quickly after drying before the plaster set; a direct and tactile method in harmony with her intuitive development of ideas. When the plaster was finished, the sculpture would be cast in bronze ‘at the same time preserving the surface details and texture made by hand and or tool’. Horse in the Rain IV is part of a series of horse sculptures that showed Frink celebrating the animals she loved, revealing ‘the spirit of the horses rather than the beasts themselves’. As part of the Royal Academy’s 250th anniversary celebrations, Frink’s large Horse and rider, 1974, commissioned by Trafalgar House for Dover Street, London, will be unveiled in its new Bond Street location by the current President, Christopher Le Brun. Sculptor and printmaker, Dame Elisabeth Jean Frink was born on 14th November 1930 in Thurlow, Suffolk and was the only daughter of Calvary officer Ralph Cuyler Frink (1899 – 1974) and his wife, colonel’s daughter Jean Conway-Gordon (b.1910). Frink had an affinity with horses from a young age. She had her first pony at the age of three and was riding by four. It was through her father that Frink also found an interest in guns and dogs. This later influenced her expression in the nature of human condition, especially after the war. In 1945 Frink travelled with her family to stay with her father who was stationed in Trieste. A short visit to Venice would change her forever and inspire her to study the art she had experienced in this new-found culture. In 1946 she applied for and won a place at the Guildford School of Art, moving from painting to sculpting after just a year of attendance. Frink then went on to be taught by Willi Soukop and Bernard Meadows at the Chelsea School of Art in 1948, where she continued to work with subjects in three dimensions. Regular visits to the school by sculptor Henry Moore were said to have had a profound effect on Frink and she also claims a book given to her on Rodin inspired her greatly, ‘This impressed me and I think as much as anything helped me to decide to become a sculptor’ (the artist cited in Sarah Kent (ed.) and Elisabeth Frink, Elisabeth Frink Sculpture Catalogue Raisonné, Harpvale Limited, 1984, p.28). In 1952, Frink exhibited professionally for the first time at the Beaux Arts Gallery, London with John Harvey and Michael Werner. This exposure led to her becoming the youngest female artist included in the national collections after the Tate bought Bird of Prey, a small bronze from the exhibition. Frink joined the staff at the Chelsea School of Art in 1954 and two years later also began teaching at St. Martin’s School of Art. 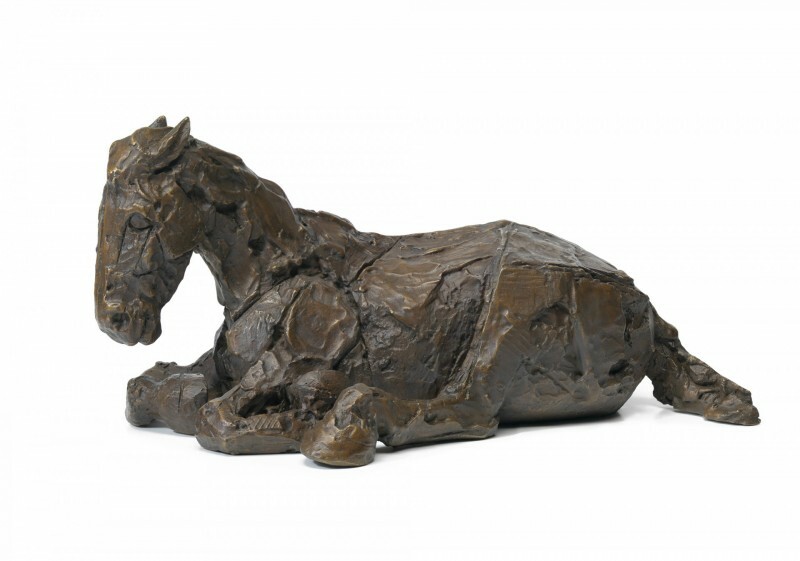 In 1955 she was given her first solo exhibition at the St. George’s Gallery, London and this signified how early success came to Frink’s career as she became the most prominent female sculptor in post-war Britain. By 1962 she had left her teaching positions in order to direct her focus to her exhibitions and commissions. Frink indulged in a shared obsession with flight that that had a profound effect on numerous artists after the war. Her collections contained series of falling figures and winged men and these themes carried on throughout her career. She pursued a variation of themes such as birds, warriors, religious motifs and in later years dogs and horses, who were her favourite companions. At the beginning of the 1970s Frink’s subjects began to have a greater sensitivity which contrasted with the aggressive nature of her Goggle Heads and her studies into mankind’s inhumanity. From 1967, Frink annually had her own solo exhibitions and her work continued to be shown in group exhibitions around the world. In 1985 she was given a retrospective by the Royal Academy and then within two years another important show at the National Museum of Women in the Arts in Washington, DC. Frink’s last work was a large, monumental and wholly untraditional figure of the Risen Christ for the Anglican Cathedral in Liverpool. She had to fight to complete this work due to her diminishing health as she was undergoing chemotherapy at the time. The Risen Christ was unveiled seven days before her death. Frink died of cancer on the 18th April 1993, two months after her husband Alexander Csaky who had died of the same condition. Frink was admired for her continual study of the human form and its affiliation to nature, forever ignoring the changing fashions around her and characteristically building her own vision. ‘I escape into my studio and put my fantasies into solid, sculptural form. I want to be able to give the idea, the crystallization, the satisfactory sculptural form without it bring mere forms that look nice. I want to have an impact on people who look at it without it being dramatic or melodramatic’ (Dame Elisabeth Jean Frink, RA, 1930 – 1993). Annette Ratuszniak (ed. ), Elisabeth Frink Catalogue Raisonné of Sculpture 1947–93, Lund Humphries, Farnham, 2013, p.9. Sarah Kent (ed. ), Elisabeth Frink Sculpture Catalogue Raisonné, Harpvale Limited, Salisbury, 1984, p.67. Stephen Gardiner, Frink: The Official Biography of Elizabeth Frink, Harper Collins, London, 1998, p.20. Edward Lucie-Smith, Elizabeth Frink Sculpture Since 1984 and Drawings, Art Books International, London, 1994, p.40. Julian Spalding, ‘Frink: Catching the Nature of Life’, Elisabeth Frink Catalogue Raisonné of Sculpture 1947–93, op.cit., p.18. The artist cited in Kenneth Clark, Sculpture in the Open Air, exh cat, Holland Park, London City Council, 1954. Sarah Kent (ed. ), Elisabeth Frink Sculpture Catalogue Raisonné, Harpvale Limited, Salisbury, 1984, p.53.